Lagerald Vick gets the main assignment on Gabe DeVoe (before switches). DeVoe is averaging 22 points in the tournament. Weird to see Svi turn down an open 3, but Newman ends the possession with a layup anyway. Smart sequence for Newman. New he didn't have space, passed out of a bad shot and then got to the rim for a good one. 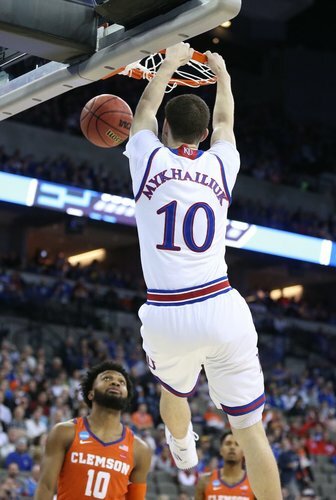 Svi completes an alley-oop. Nice start for KU. #KUbball leads 6-2... All 6 points in the paint so far. Graham rebounding his own miss sets up 2nd chance for KU and after Svi and Newman pass up 3's, Newman drives in for layup. Back to back turnovers for Clemson's offense. Tigers shooting 1 for 5. Elijah Thomas with as good of post defense as you'll see this season on Udoka. Then dunks it on the other end. Lagerald Vick drills a 3, then stares down Clemson's bench. He's been playing great over the last 2 weeks. Lagerald Vick jawed at a member of the Clemson bench after that shot. Player jawed right back. First foul on Elijah Thomas entering the media timeout. 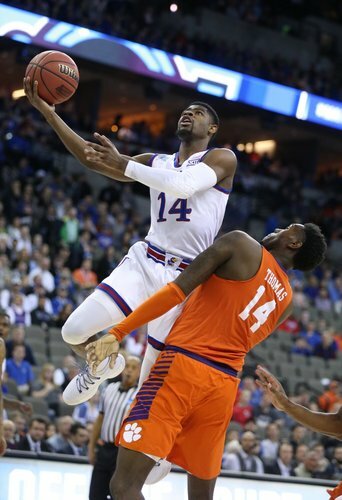 Bad pass made worse by a bad foul by Clemson's Elijah Thomas... Under-16 timeout in Omaha, #KUbball leads 11-6 and has possession out of the timeout. 3 Clemson turnovers in opening 5:15. Clemson is 18-0 when winning turnover margin. Like Newman's assertiveness early. Sought out drives for layups and got a couple. Good look at a 3 missed but just rimmed out. Very good 5 minutes.....keep going! Great pass by Skara. Clemson has all of its points in the paint. Let's do this Hawks! They look solid. Lightfoot and Garrett in for #KUbball and Clemson gets another layup. Tigers passing is precise. KU D will have to be disciplined all night. 11-8, Kansas. Devonte' Graham is 0-for-4 from the floor. Graham off to an 0-for-4 shooting start in first 7 minutes. Glad they are turning it over a lot. Not sure we are doing a good job of stopping them. Udoka has to move faster in the post. Took too long to gather himself before traveling.